What’s the Deal with Biosimilars? Biosimilars are gaining momentum as new protein therapeutic candidates that can help fill a vital need in the healthcare industry. The biological drugs are produced by recombinant DNA technology that allows for large-scale production and an overall reduction time in costs and development. 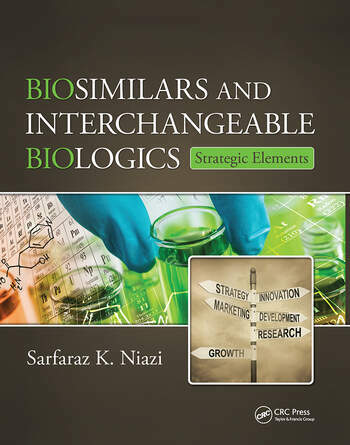 Part of a two-volume set that covers varying aspects of biosimilars, Biosimilars and Interchangeable Biologics: Strategic Elements explores the strategic planning side of biosimilar drugs and targets issues surrounding biosimilars that are linked to legal matters. This includes principal patents and intellectual property, regulatory pathways, and concerns about affordability on a global scale. It addresses the complexity of biosimilar products, and it discusses the utilization of biosimilars and related biological drugs in expanding world markets. Of specific interest to practitioners, researchers, and scientists in the biopharmaceutical industry, this volume examines the science, technology, finance, legality, ethics, and politics of biosimilar drugs. It considers strategic planning elements that include an overall understanding of the history and the current status of the art and science of biosimilars, and it provides detailed descriptions of the legal, regulatory, and commercial characteristics. The book also presents a global strategy on how to build, take to market, and manage the next generation of biosimilars throughout their life cycle. Sarfaraz K. Niazi, PhD, is the founding executive chairman of Therapeutic Proteins International LLC, a world-class pure-play developer and manufacturer of biosimilar and interchangeable recombinant biologics, headquartered in Chicago. Dr. Niazi began his career teaching pharmacy at the University of Illinois (1972–1988), where he became a tenured professor. He then entered the pharmaceutical industry at Abbott International, becoming a Volwiler Fellow. He left Abbott in 1995 with a passion for making high-cost biological drugs affordable. Dr. Niazi set up several ex-U.S. biosimilar companies and, in 2003, established Therapeutic Proteins International, the only U.S. integrated company of its kind to date.